The kids are napping. I'm catching up on blogs, working on posts for the week and watching hockey. I'm not a hockey fan, but didn't want to miss Team USA vs Team Canada. Is it too terribly wrong of me for wanting Canada to win? My mom watched the kids last night. The Hero and I had dinner at my favorite Mexican restaurant then went to see Shutter Island. I liked the eventual path of the storyline, but didn't like how long it took to get there. I think I need to see it again when I'm not so tired. Who am I kidding? I'm always tired. 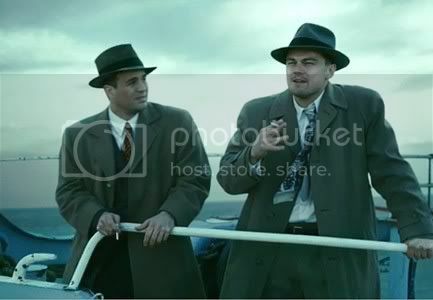 If you've seen Shutter Island, what did you think of it? I thought it was interesting. I think the ending is a little unbelieveable, but overall, I thought Leo was amazing, and it was an interesting movie. I haven't seen it, but heard it wasn't that great. Is it scary? We're avoiding scary movies for a while since our last movie is still haunting us...weeks later. I saw it last weekend and loved it. I was truly surprised by the ending and was on the edge of my seat throughout the feature. I'm a huge Leonardo fan... he rocks. I haven't seen the movie, but I just started reading the book. I am told that I won't want to see the movie because the book is much better. I got sucked into watching hockey last night with hubby too. I don't usually watch it but it was a really go game. Yes, it's terribly wrong. Terribly. I want to see that but Derek hates scary movies. F.
I'm wanting to see this one..
Yeah, a movie that is longer than 2 hours always turns me off. I am always tired too!